Nepalese Lokta Paper is an eco-friendly paper with long and strong pulp fibers ideal for origami sculptures that have many folds and creases. • 40-50 GSM • Made in Nepal • 12 sheets of 6" x 6"
You will absolutely love folding with Nepalese Lokta Paper! 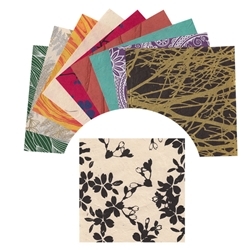 Nepalese Lokta Paper is an eco-friendly paper, handmade from the fiber of the "Nepal Paper Plant," also called the Daphne Shrub or Lokta Bush. The pulp fibers are long and strong for origami sculptures that have many folds and creases. The colors and designs are all hand-dyed and silkscreened providing a truly unique piece of paper for every project. This pack includes a random variety of vibrant silk screened prints, sun-washed and color styles to jazz up any origami project!